The New Year is almost here, and it’s time for a few resolutions. Are your organizational skills a little lackluster? It’s okay; BitsDuJour has a number of organization apps that will help you put a little more organization into your desktop. Here are a few of our favorites. Let’s face it, deadlines are sneaking up on you, you’re always late for important meetings and you can never seem to remember your mother in-law’s birthday. Atomic Alarm Clock can help you! 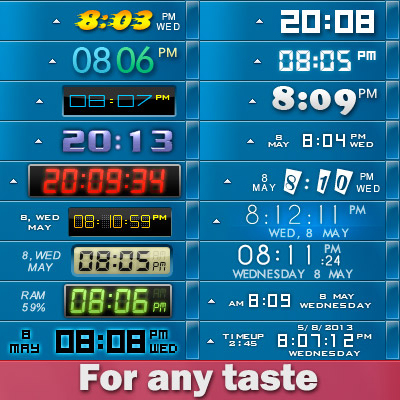 Atomic Alarm Clock gives you the ability to set different alarms for different events, and replaces your system clock with a much cooler clock with different skins. Atomic Alarm Clock not only gives you the ability to see the time (duh), but you can set countdowns, percentage of memory used, system uptime, and so much more! Sometimes you can’t have enough space on your desktop. You have so many files! 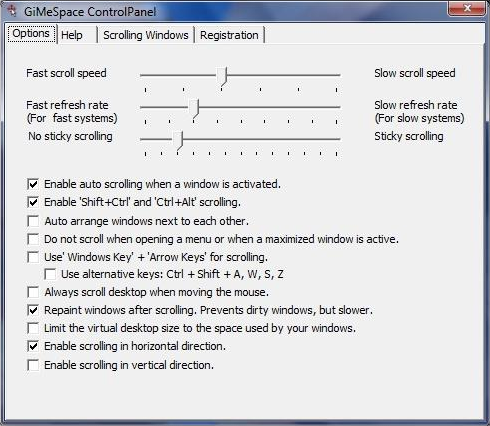 GiMeSpace Desktop Extender 3D is a scrolling virtual desktop manager that not only gives you more desktop space, but lets you resize windows without any limitations! Navigating your desktop in three dimensions means that you can zoom in to see more detail, or zoom out to see the big picture. The best part? You can still work with your windows even if you're zoomed in or out! Do you have that nasty habit of saving all of your downloads onto your desktop? 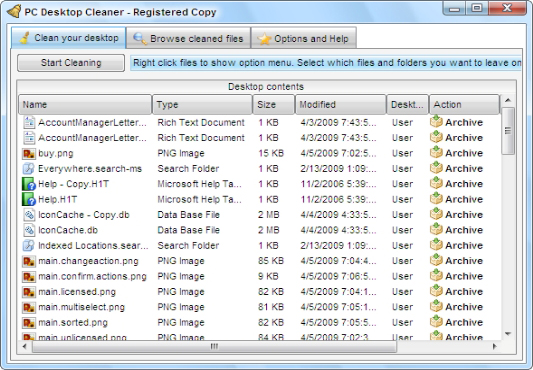 PC Desktop Cleaner will help manage the chaos sprawled across your desktop. Just install Desktop Cleaner, click on the 'Start Cleaning' button, and WHAM! Your desktop is clean. With Desktop Cleaner, you can set up rules to determine whether files on your desktop should be archived, moved to a folder, deleted, or left untouched. Your Desktop always seems to be cluttered with files you don’t need or haven’t even used in months. ClutterKiller helps eliminate this common problem. ClutterKiller is a program that manages your extraneous or unorganized desktop files (based on their extension names) via separate, easily accessible folders. ClutterKiller will certainly clean your computer's desktop and likely make you a more efficient -- if not saner -- PC user. Do you wish the folders on your desktop were a little more “organizable”? These two apps can help you add information to your cluttered desktop that will help you find anything you need seamlessly. Folder Marker Pro + Extra Folder Icons Bundle is a collection of two programs that let you mark folders by content, priority, and status, plus jazz up your Windows folders with new icons. Folder Marker Pro lets you mark folders to indicate, at a glance, their priority, level of completeness of a project, project status, or type of files they contain. With Extra Folder Icons, you’ll be able to drop your work into folders that reflect the topic: medical documents, coding, entertainment, and more. Plus, each icon features realistic shadows and extremely detailed cover images. Stuart Clarke Why anyone would ever need to de-clutter their desktop is beyond me because there's no need to clutter it in the first place. Every program executable on any and every PC can be right clicked to produce a 'send to desktop' shortcut. Once all the shortcuts are there on the desktop, simply go into Windows Explorer and create a new folder in 'My Documents' and label it 'My Programs', or some such. Then, create new sub-folders for each type of program or app, whether it's Maintenance (into which, for example, shortcuts to Revo and CCleaner and Defraggler can be popped) or Video (for video editors and converters) or Audio (for stuff like MP3 editing and MP3 gain control), etc etc. The effort required to do all this takes no more than 5 minutes. Once the sub-folders are in place, move the newly created desktop shortcuts into each appropriate sub folder. When that's done, delete every icon on the desktop so that it's clean and clear again and showing your favourite picture or animated wallpaper: mine's a HD aquarium. Then, right click on 'My Programs', the folder you've made and within which you've nested all the other sub folders, and create a 'send to desktop' shortcut link to that. Finally . . . Move the shortcut onto your desktop. (In Vista, you can move the 'My Programs' shortcut neatly into Quick Launch, so it's not even on your desktop. Unfortunately, Microsoft was typically arrogant enough to substitute the inferior 'taskbar' for QL in Win7 onwards and no, that bar won't let you shortcut the 'My Programs' folder to it. However. . . If you've another 5 minutes to spare, then it's an easy matter to bring the Quick Launch bar back to Windows 7. I have. I've also chucked out the unwanted and unasked for ridiculous 'Libraries'. Either way, whether your shortcut is on the desktop or in your QuickLaunch (or newly restored QuickLaunch) the fact is that you've just structured -- in a sensible way -- your access to all the programs you're using the most often. . .
And you haven't covered your beautiful flat screen monitor in endless junky icons. Even better: you've also saved yourself the bother of ever having to resort to "desktop cleaning software" of the type publicised here.